Um livro que nos faz viajar até à Índia e que traz até nós, as cores, os cheiros, o calor e as flores da cultura indiana. Num passeio mágico por cantinho do jardim que a mãe de Lili criou com as plantas que foi recolhendo nas suas viagens pelo mundo, ouvimos histórias sobre as flores e as plantas da Índia, sobre a cultura e as tradições indianas. No final do livro há ainda guia sobre as plantas referidas ao longo da história e outro sobre as festividades indianas. A book that makes us travel to India and brings to us, the colors, the smells, the flowers and the warmth of Indian culture. 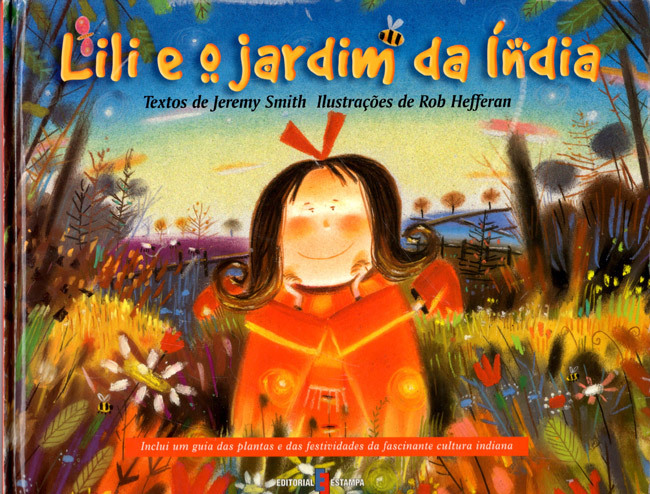 In a magical ride in the little corner of a garden created with plants collected by Lili's mother, we hear stories about the flowers and plants of India, about the Indian culture and its traditions. At the end the author present us with a guide about the plants mentioned throughout the book and another about Indian festivities.